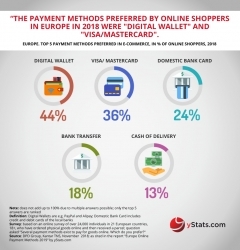 A series of new publications from Germany-based secondary market research company yStats.com highlight online payments and include reports such as “Global Online Payment Methods 2019,” “Europe Online Payment Methods 2019” and “Asia-Pacific Online Payment Methods 2019.” These reports shed light on the latest developments in digital payments worldwide. Although E-Commerce sales maintain rapid growth, fear of fraud is still a major barrier in many nations. yStats.com’s research finds that online payment fraud losses are expected to double between 2018 and 2023. As a result, digital buyers opt for payment methods which they deem most secure. These perceptions vary by country, driving the popularity of cards and digital wallets in advanced markets, while also helping cash on delivery maintain a leading position in selected emerging economies. In addition to safety, online shoppers also value the ease and convenience of payments. In the U.K. and the U.S., a high percentage of digital buyers save payment card details for faster checkout in future purchases, while in Brazil more than one in three respondents to a survey, cited in the yStats.com report, would choose a mobile shopping app that offers payments in one click. Overall, the preferences of global online shoppers vary by country and region, encouraging E-Commerce merchants to adjust their payment mix. Another major development is the rise of mobile payment services. Above one-third of connected consumers already use mobile payment services, with Asia-Pacific outpacing all other global regions, in terms of adoption, as the yStats.com report shows. As interest in payments by phone rises, services such as Apple Pay are expected to expand their user base in the near future. In China alone, more than half a billion people use mobile payments, most of which use Alipay. Although Europe lags behind other global regions, such as Asia-Pacific, in terms of mobile payment adoption, the use of payments on smartphones, tablets and wearables is rising. Scandinavian nations and the UK are among the leaders of this trend, especially when it comes to making mobile payments in-store. Also consumers in emerging economies across Europe show interest in mobile wallets. In Russia, the use of Google Pay, Apple Pay and Samsung Pay by connected consumers is already in the double-digits, according to statistics cited by yStats.com.